In my view, summer time is good for vacations, research papers and strategic projects. During the summer, you are always have an excuse to stop, think and do something unusual. This is also time to clean up emails and feeds. 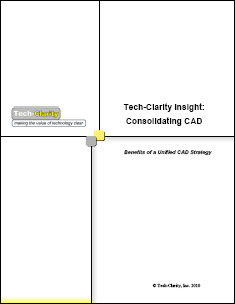 I read a new research paper just published by Jim Brown of TechClarity: Consolidating CAD – Strategic Advantages at Reduced Cost. I found it interesting. Jim’s conclusion is simple – consolidate your CADs, cut cost, reduce complexity, improve collaboration. It sounds very straightforward and simple. Nevertheless, some latest publications made me think that such a decision might be more complex. I’d like to propose to discuss it more and take a look on different perspectives of CAD unification decision. The status quo of engineering and manufacturing companies these days is multiple CAD systems. For different reasons, people are using different CADs. Usually, it was a result of historical decisions, old/new projects, M&A activities and some others. Large OEMs have a tendency to choose different CAD system also due to decisions taken by divisions. Suppliers are influenced by their work for multiple OEMs and also can consider various CAD options as sometime very reliable. In addition, cost factor is another reason why organizations can make their decision to diversify CAD packages. I can identify several important trends that can influence customer decision related to CAD system usage: (1) 3D direct modeling; (2) Openness; (3) Cloud. During last few years, we have seen a significant innovative activity so-called direct 3D modeling vs. parametric design. New and existing companies focused on direct 3D modeling drove established vendors to make acquisitions or made a significant development in this space. This is not a completely new trend. Openness and interoperability have been very popular many years. My view, is that during the past couple of years, there is a renaissance of “openness discussion” driven by web development and open source related activities. This is another very popular trend. What will happen when/if CAD will be moving to the cloud? How to leverage cloud technology? There are lots of discussions about this topic recently happened in blogs, industry and vendor’s conferences. We are all waiting for PTC Lightning strike in October. A good review of what PTC is thinking about made by SolidSmack. Navigate to this link. Also, take a look on the following slide from PTC about this project – The Right Solution For Every User. We don’t know for sure, what PTC is preparing as part of their new project. However, I can see a glimpse of thinking about tools’ diversification. You can read some “un-answered” questions about this project in Deelip’s blog. Navigate to the following link – SpaceClaim 2010 Externds to Non-Engineering Groups. You can see a definite interest of SpaceClaim to propose more diversification into 3D CAD usage in organizations. The advantages of a single tool and value proposition made by Jim in his research is clear for me. However, to implement unified CAD strategy can be complicated and long process. As an alternative, CAD vendors can propose new potential solutions to solve old problems – open/free tools, cloud products, various tools’ diversification that can make customers think more about the CAD strategies. Yes, I offered a model for people to calculate their potential cost savings from a unified CAD strategy. But I also point out the strategic benefits of reuse and corporate flexibility, which in my discussions with manufacturers has been a bigger driver of consolidation than cost savings. And the ability to unify CAD into a bigger-picture, unified PLM implementation is another big driver. It is not just about cost (although that is easy to quantify). There is nothing simple about consolidating on a simple package across the enterprise. I do not pretend that is trivial. Enough said on that. There are reasons that companies may want to have multiple CAD systems. I mention different modeling paradigms (parametric modeling versus direct) in the report. There are many reasons you may want to have an additional set of capabilities. Unlike you, I don’t think that companies are clamoring to get to “the cloud” as a strategy that would drive their selection of a CAD tool. That would be the tail wagging the dog. As far as openness as a strategy in the CAD industry, I would rather adopt making wishes on shooting stars as my strategy. While it sounds good, there are too many market forces making that unlikely in our new future. So I realize that I started my discussion on the benefits of unification. I am actually about to publish a paper that discusses the decision between unification and multi-CAD which does a better job of presenting both sides of the equation. Perhaps I had the cart before the horse (had to throw in another analogy) in my publication schedule. Nothing like a little spirited discourse to kickoff the week. I haven’t read Jim’s blog yet but it would be difficult to refute the benefits of a unified CAD strategy assuming the CAD tool is robust enough or easy enough to use to meet your needs. As companies grow through aquisition they take on new products that may not be best served by forcing all users on to a single platform. By the time you convert your data and retrain your users you could find yourself in deep trouble from a cost and productivity perspective. As you point out there are a growing number of technologies out there that facilitate the reconciliation of multiple CAD and PLM tools. It is dangerous to make a broad statement that consolidation is always the best answer. I am sure Jim is not taking that position but rather saying that it might be something to assess as a means to streamline a company’s product development process among many other potential bottlenecks and productivity inhibitors. We invite you to take a look at CAD2Design.com, a new site (we call it a Vertical Channel Syndicator) that compiles breaking PLM resources from across the web and presents them to viewers in real-time. Your blog feed is one of many in the PLM Channel. There are currently 34 Channels in all. We would value your feedback. Thanks for your clarifications and comments! It is obvious that I wanted you to join this discussion. I understand your point about a customer’s ability to unify CAD. However, my view is that every company running multiple CAD packages (naturally) is trying to unify. This is not simple. Therefore, you were absolutely right by pointing on “CAD Unification Option” as a very valuable one. Nevertheless, I think, CAD Unification strategy takes us back in reverse into the very old discussion about “openness” and “interoperability”. It can promote the wrong idea of building siloed world opposite to the open world. In addition, if you think more about PLM, CAD unification strategy can help to build integrated vertical systems of CAD/PLMs. There are obvious advantages and disadvantages in such solutions. I’m afraid, without proper clarification of topics related to multi-CAD you mentioned. This clarification can be very beneficial, in my view. So, I’ll be waiting for your next papers. It is really funny that we are debating CAD strategies :). However, things are getting more and more connected. In fact, these two trends (strategies) are not new, they have always been in CAD market and, to some extent, go together. Companies want to standardize on one CAD and some do, but then there are those features / legacy / subcontractors / alianses that make other companies chose multiple CAD as better business option. It is like languages. Wouldn’t it be nice if the entire world speaks just English? Such huge cost reductions, strategic benefits. Why people are so foolish not to see it? It’s an adventurous look at how business is changing due to the ease of digital connections. It also gets into the degree to which companies outsource almost any activity they can. People might be surprised at the size of the supply chain bringing a common product to your door. It’s not just outsourcing, though. It’s often just multinationals with offices in many global locations. My point: it is totally backwards and outdated to think that a company should need to standardize on a single CAD tool across their entire business ecosystem just to be able to work with geometry. You should be able to use whatever tool you want and have the intelligence live inside the geometry itself. For example: I’m reading this blog post in Chrome. I’m sure others are reading it in IE or Firefox. But, we’re all consuming the same data regardless of which tool we choose to use. If you are going to have to build a business with a global supply chain (or really any size supply chain), seems silly to expect the whole world to adopt a single tool. The future is an open format with Software vendors concentrating on making their CAD tool the most appealing form of consumption. Ah, yes. I forgot about that one. An excellent post, too. I think we see the same future. Hi Oleg, Thanks for the response and sorry for my late response. However, can contact me via email to discuss this issue with CAD2Design.com? You can reach me using the email address used with this registration. Thanks you! Don, Tnx! will do so.